This is what all 80+ year olds, and those yet-to-be, have to look forward to!! This is something that happened at an assisted living center. The people who lived there had small apartments but they all ate at a central cafeteria. One morning one of the residents didn't show up for breakfast so my wife went upstairs and knocked on his door to see if everything was OK.
She could hear him through the door and he said that he was running late and would be down shortly, so she went back to the dining area. An hour later he still hadn't arrived so she went back up towards his room but found him on the stairs. He was coming down the stairs but was having a hell of time. He had a death grip on the hand rail and seemed to have trouble getting his legs to work right. She told him she was going to call an ambulance but he told her no, he wasn't in any pain and just wanted to have his breakfast. When he tried to return to his room he was completely unable to get up even the first stair step so they called an ambulance for him. A couple hours later she called the hospital to see how he was doing. The receptionist there said he was fine; he just had both of his legs in one side of his boxer shorts. Women often receive warnings about protecting themselves at the mall and in dark parking lots, etc. This is the first warning I have seen for men. I wanted to pass it on in case you haven't heard about it. A 'heads up' for those men who may be regular customers at Lowe's, Home Depot, Costco, or even Wal-Mart. This one caught me totally by surprise. Here's how the scam works; Two very beautiful, college-age girls will come over to your car or truck as you are packing your purchases into your vehicle. They both start wiping your windshield with a rag and Windex, with their breasts almost falling out of their skimpy T-shirts. (It's impossible not to look). When you thank them and offer them a tip, they say 'No' but instead ask for a ride to McDonald's. I had my wallet stolen November 4th, 9th, 10th, twice on the 15th, again on the 17th, 20th, 24th, and the 29th. Also December 1st, 2nd, 8th, twice on the 16th &17th, and very likely again this upcoming weekend. Also, you never get to eat at McDonald's. I've already lost 11 pounds just running back and forth from Lowe's, to Home Depot, to Wal-Mart. Suddenly I noticed that there were several cabs - - -and I was in the wrong one. 'Yes, they used to be,’ Replied the patient. 3. One day I had to be the bearer of bad news when I told a wife that her husband had died of a massive myocardial infarction. styled into a punk rocker Mohawk, sporting a variety of tattoos, and wearing strange clothing, entered. 8. As a new, young MD doing his residency in OB , I was quite embarrassed when performing female pelvic exams. Recently there was a Mensa convention in San Francisco . Mensa, as you probably know, is a national organization for people who have an IQ of 150 or higher. Clearly, this was a job for Mensa minds. The group debated the problem and presented ideas and finally came up with a brilliant solution involving a napkin, a straw, and an empty saucer. They called the blonde waitress over ready to dazzle her with their solution. "Ma'am," they said, "we couldn't help but notice that the pepper shaker contains salt and the salt shaker has pepper." But before they could finish, the waitress interrupted: " Oh, sorry about that." Kind of reminds you of the past 30 years in Washington D C., doesn't it? Arizona bikers were riding South on the US-93 when they saw a girl about to jump off the Hoover Dam Bridge . So they stopped. George, their leader, a big burly man of 53, gets off his Harley, walks through a group of gawkers, past the State Trooper who was trying to talk her down off the railing, and says, "Hey Baby.....whatcha doin' up there on that railin'?" While he didn't want to appear "sensitive," George also didn't want to miss this "be-a-legend" opportunity either. So he asked ..."Well, before you jump, Honey-Babe...why don't you give ole George here your best last kiss?" So, with no hesitation at all, she leaned back over the railing and did just that...and it was a long, deep, lingering kiss followed immediately by another even better one. After they breathlessly finished, George gets a big thumbs-up approval from his biker-buddies, the onlookers, and even the State Trooper. He then says, "Wow! That was the best kiss I have ever had, Honey! That's a real talent you're wasting. You could be famous if you rode with me. By the way, why are you committing suicide?" Don't mess with the old dogs. Age and skill will always overcome youth and treachery! If you don't send this to five 'old' friends right away, there will be five fewer people laughing in the world. Of course, I am in no way insinuating that you are old, just 'youthfully challenged'. Here's one for you all---There are many different dogs in this world. My favorite is a Husky or an Alaskan Malamute. Thereafter, a German shepherd. Anyhow, they're a hairy dog. The mange is a skin disease and, it's tough on Schnauzers. Well, this lady owned one and, it got the mange. One would have to shave the dog in areas and apply this ointment to the skin. The vet gave her the prescription (as it can also be used on humans) for the ointment. She went to the Pharmacy and gave it to the clerk. When he saw what it was, he immediately said---"If this is used on your head, you cannot wear a hat for two weeks". She said it wasn't for her head. Then, he said..."if you're going to use it under your arms, you cannot wear armpit shield for two weeks'. She replied..."It's not for my head or my armpits. It's for my Schnauzer". He immediately replied...Then you cannot wear pantyhose for two weeks". 65 Years Ago For You History Buffs! 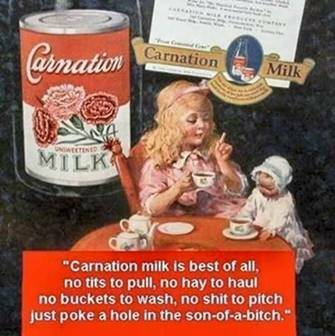 The producers wanted a rhyme beginning with “Carnation Milk is best of all”. A large man got out, knocked on her door and said, "Ma’am, The president of Carnation milk absolutely LOVED your entry....So much, in fact, that we are here to award you $1,000 even though we will not be able to use it for our advertisements!" He did, however, have one printed up that now hang on his office wall. This is not true but makes for good reading!! !